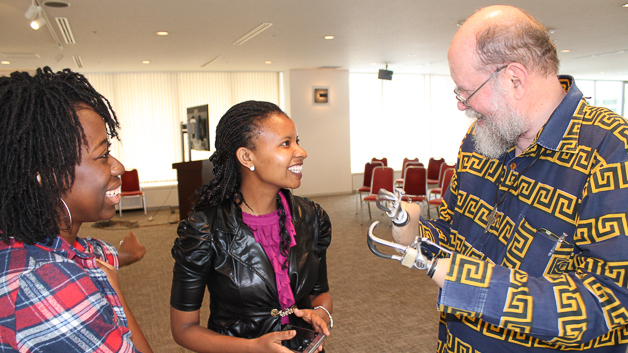 On 13 June 2015, UNU-IAS welcomed Father Michael Lapsley (Representative, Institute for Healing of Memories) as a lecturer for the 6th “Mandela and I” monthly lecture series. Father Lapsley became a member of the African National Congress and mobilized support against institutional racism after he was expelled from South Africa during apartheid. Following Nelson Mandela’s release from prison, Father Lapsley was sent a letter bomb from which he lost both hands and his sight in one eye. He established the Institute for Healing of Memories to offer opportunities for South Africans to tell their stories in workshops where they can work through their trauma. Father Lapsley closed his lecture by encouraging participants to speak out for what they believe, and to become one of the many “Mandelas” around the world. “Mandela and I” is a monthly lecture series, designed for students who are interested in studying the lessons and legacies of Nelson Mandela as a way to improve their understanding of leadership and moral authority in the world. The lecture series is organized as part of the UNU-IAS project Education for Sustainable Development in Africa (ESDA), with the cooperation of the South African Embassy in Tokyo.